Dresden, Germany (ENInews). The biennial faith gathering called the Kirchentag ended on 5 June after five days of theological and political discussions, concerts and a sense of reconciliation in a city devastated during World War II. 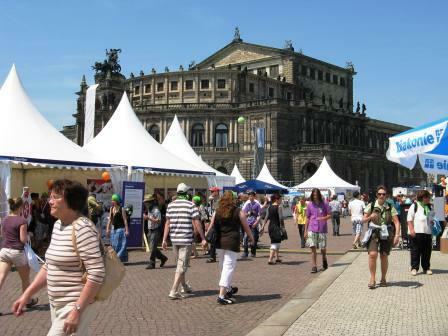 "It was a Kirchentag where a new culture of participation and shaping democracy was discovered. 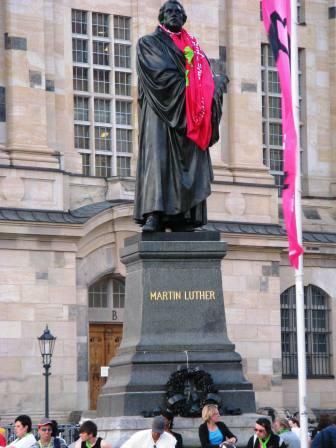 A Kirchentag of active politics. A Kirchentag where we had open, thought provoking debate, even if it was controversial at times," Katrin Goering-Eckardt, president of the Kirchentag and a prominent politician said on 4 June. The gathering, which means "church conference" and was founded after World War II, ended with an open-air church service on 5 June attended by 120,000 people on both banks of the River Elbe. Dialogue with central and eastern Europe was one theme. Visitors from north Africa attended, prompting Kirchentag secretary-general Ellen Ueberschar to comment, "It was possible at this Kirchentag for people from the post-Communist societies who twenty years ago had their peaceful revolution to meet and discuss with revolutionaries from Egypt." Theological and political issues ranging from the ethics of war and peace to a nuclear power-free society were discussed, with controversial and opposite views often courted. The former chairperson of the Evangelical Church in Germany (EKD), the Rev. Margot Kaessmann, criticized German military involvement in Afghanistan. A day later, an emotional Thomas de Maiziere, Germany's Minister of Defence, having earlier that morning attended the funeral of a German soldier killed in Afghanistan, was defending the German involvement in that country. "We want to prevent the export of terrorism," he said. 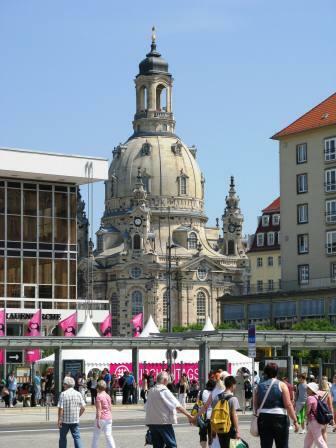 The heart and symbol of the Dresden event was the Frauenkirche (Church of Our Lady) which hosted services and discussions. Destroyed by Allied bombers in the final months of World War II, it was left as a ruin for nearly half a century under Communist rule in East Germany. After the reunification of Germany in 1990, the church was rebuilt and re-opened in October 2005. On Ascension Day, 2 June, Bishop Nicholas Baines of Bradford in the United Kingdom told the congregation: "It is a privilege to be here but it is also a stirring experience. I'm English and I'm standing on the pulpit of a church that in February 1945 was destroyed by Allied bombs. At the time the world was torn apart by conflict. Yet we meet so many years later as brothers and sisters in Christ. It is also good that an Englishman is standing on this pulpit today and contemplating Jesus' words." Daytime events were followed in the warm summer evenings by musical concerts on squares and in churches and in sports stadiums all over the city ranging from classical to gospel to pop and jazz and even punk. Forty percent of those who attended were under the age of 30. In a secular city where the legacy of Communism means that only 20 percent of the local population belongs to a church, the 2,300 events of the Kirchentag gave Christianity a high profile. "Many citizens experienced the church in a very different way during these days than they expected. The Dresden Kirchentag strengthened us Christians, others it hopefully gave an insight into what a life with God means," Jochen Bohl, the Evangelical Lutheran bishop of Saxony, told journalists.